DANIELSON SPORTSMAN'S SHEARS This handy, full sized 8" game and fish shears features high carbon, stainless steel blades and comfortable molded handles with built-in vise gripping jaws. These indispensable shears are made with the outdoor enthusiast in mind to provide options that are not practical with a knife. 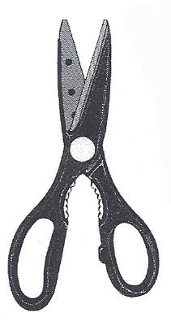 Lightweight and easy to use, these shears are great for many household uses. One per package.